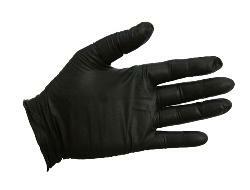 4-mil nitrile is stronger and more durable than disposable latex or vinyl gloves. Nitrile offers an excellent barrier against a broad range of chemicals for incidental splash and contact. Glove stretches to conform to the hand for enhanced dexterity and tactile sensitivity. The rolled cuff gives a better fit and reduces tearing. The powder-free style eliminates any powder contamination. The textured finish offers excellent wet grip for safer and easier handling task. Ambidextrous to fit either hand. Industrial grade. Black color. Glove length: 9”. Sizes: small, medium, large and XLarge. Work applications include assembly, biohazards, chemical processing, food processing, inspection and quality control. 100 gloves per box. Sold by the box.